The Zenith 807 was one of several white dial models introduced in 1934 for the 1935 model year. 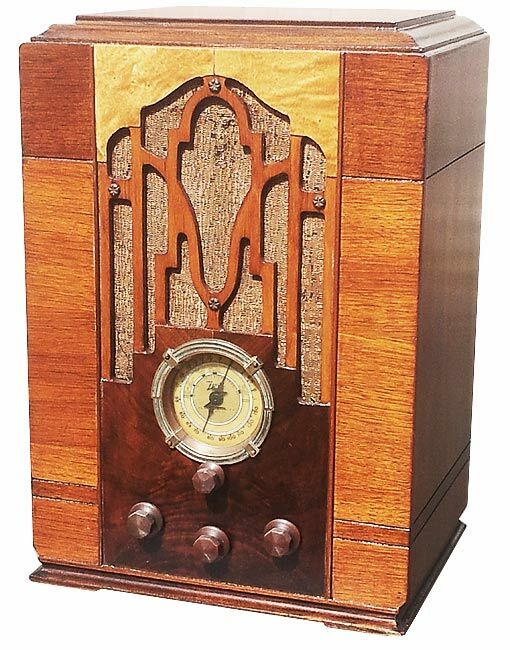 A beautiful set with an attractive mix of wood veneers, the 807 was originally priced at $44.95 and was positioned at the low end of the 1935 lineup. I traded a radio for this example at the May 2015 VRPS swap meet. The cabinet was in fair condition with various small damages to the wood trim and veneer as shown in the before photo below. I stripped and refinished the cabinet using a light Pecan color stain for the entire cabinet except the top, trim and darker body sections were stained with the Special Walnut color. The radio needed repair and did not have the original speaker. After I inspected the chassis, I could tell that the previous owner attempted to repair the radio because the electrolytic capacitors had been replaced. I went on to replace the remaining paper capacitors. The tube shields are required for this radio to play and they were originally missing. After remedying that problem, the radio managed to smoke the field coil of the 1960s replacement speaker for no apparent reason after I checked voltages and there were no shorts on the B+ rail. I had no luck finding a Zenith replacement speaker, but I had a 1936 Silvertone speaker that I realized were compatible with the dimensions and impedances that it finally got put to good use after 13 years of collecting dust in storage. 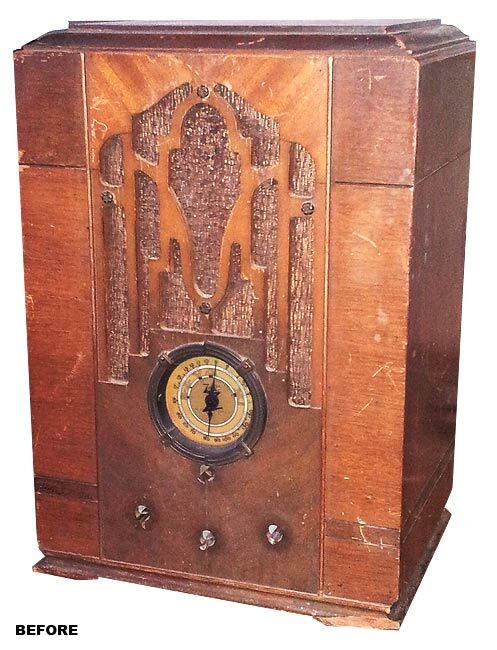 Afterwards, the radio was not quite fixed yet because it would whine and warble when receiving any station. Performing the alignment procedure did not fix the problem. After several hours of debugging, I decided to pull all the tubes and test them carefully not only for emissions but also leakage of internal elements. It turns out the 6A7 oscillator/mixer tube had an internal short that caused the problem. After replacing the 6A7, the radio played well like one would expect for a 5-tube superheterodyne.